Artist's rendition of the BEAM inflatable habitat on the ISS. An inflatable room that will be attached to the International Space Station (ISS) is scheduled to launch toward the orbiting laboratory next week. 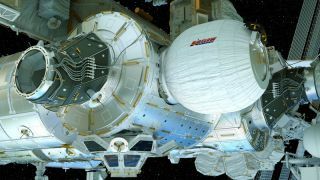 The room, known as Bigelow Expandable Activity Module (BEAM), was built by Bigelow Aerospace, a private company that has built other expandable space habitats in the past and has plans to continue to do so. BEAM will be the first such room to be tested on the ISS, and the first to be (briefly) occupied by astronauts. Inflatable habitats like BEAM offer the possibility to build large habitats on the ground and send them to space in much smaller payload fairings. When fully inflated, BEAM provides a total of 565 cubic feet (16 cubic meters) of livable space. It expands to more than five times its compressed size of 105.9 cubic feet (3 cubic m). The key challenge in building flexible or collapsible space habitats is that they also must be able to protect astronauts from space radiation, as well as withstand a collision with a piece of space debris or a micrometeoroid. Lisa Kauke, BEAM deputy program manager at Bigelow Aerospace, said during yesterday's teleconference that BEAM meets the requirements set for the rest of the space station for withstanding those threats. She said she could not expand on exactly what BEAM is made of, because that information is proprietary. However, she did note that BEAM consists of a "soft goods, expandable material." It also includes a load-bearing structure made from something similar to Vectran, a manufactured fiber made from a liquid crystal polymer used in some space suits. Kauke said the BEAM material has been shown to "perform up to the standards of the ISS." BEAM is also covered by a Micrometeoroid and Orbital Debris Protection layer, which is also proprietary to Bigelow, Kauke said. In the 2000s, Bigelow launched the Genesis 1 and Genesis 2 inflatable space habitats, both of which were put into orbit successfully but never carried humans. The company also is testing multiple habitats on Earth. Kauke said there is "not much more" that Bigelow needs to test with regard to its inflatable habitat technology before making them fully accessible to human space travelers. "As a company, we're really comfortable with the technology," Kauke said. "We certainly demonstrated successfully that these modules can hold their pressure on orbit. We demonstrated our materials and processes." Rajib Dasgupta, NASA project and technical integration manager for BEAM, said that from NASA's perspective, the structural safety requirements are higher for a human-rated module than for a non-human-rated one, so BEAM will have to demonstrate that it can perform at that level. "The BEAM program is our company's next logical step in development, and it serves as our pathfinding to building manned spacecraft for the future," Kauke said. "By attaching BEAM to the ISS, we'll be able to evaluate our technology, elevate its technology readiness level and demonstrate that we are ready to support humans in space." BEAM will launch to the station atop a SpaceX Dragon cargo capsule on Friday, April 8, at 4:43 p.m. EDT (2043 GMT). The inflatable module makes up about 3,100 lbs. (1,400 kilograms) of the 4,400-lb. (2,000 kg) payload carried by the Dragon capsule. Upon arrival at the space station, the ISS' robotic arm will remove BEAM from the Dragon capsule's "trunk" — a procedure controlled remoted from the ground. The arm will then attach BEAM to Tranquility Node of the station. Astronauts on board will be responsible for inflating the module, which Dasguptasaid should take only about 45 minutes. (You can see a video of the installation procedure here on Space.com). Astronauts also will be responsible for installing a series of sensors that will test BEAM's resistance to radiation and debris. After a minimum two year test period, BEAM will be jettisoned from the station and will burn up in Earth's atmosphere.